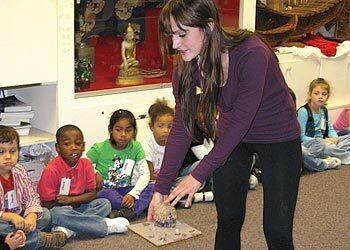 The Museum of Anthropology offers a variety of hands-on curriculum-based programs for grades K through 12. Each program uses images and artifacts from the Museum’s collections to teach students about specific peoples and cultures. All programs are designed to support the Competency Goals and Objectives of the NC Standard Course of Study. All curriculum-based programs are available both in the Museum and as outreach programs in the Winston-Salem/Forsyth County Schools. For WSFCS middle and high schools, as well as schools outside of Forsyth County, MOA also offers these programs via Skype. Although the programs are designed for specific grade levels, they can be modified to accommodate students of any age. Please let the Museum know if any modifications are needed to accommodate students with disabilities. If there is a topic that you would like covered that is not listed here, please contact Museum Educator Tina Smith at 336.758.5643 or smithth@nullwfu.edu to discuss creating a customized program. Programs offered for K-12 students can be found on our available programs page. The fee for curriculum-based programs is $3.00 per student. There is no charge for accompanying teachers and adults. There is a minimum charge of $60 per class (i.e. if your group has fewer than 20 students, you will pay the minimum fee.) For outreach programs, a nominal flat fee will be added to cover the Educator’s mileage to and from the school. For Skype programs, there is a flat fee of $25 per session in place of the per student fee. The total fee is payable by cash or check only to the Museum of Anthropology. Payment is due at the time of the program unless other arrangements have been made. An invoice will be included in the confirmation packet mailed four to six weeks before your program. Reservations are required for any group, whether you would like a curriculum-based program or a self-guided tour. Groups without a reservation may be turned away. The maximum group size in the Museum is 50 students. Reservations are accepted on a first-come, first-served basis. Programs can be scheduled Monday through Friday during school hours.